In this post, we review a robot platform by Freescale. Freescale’s Tower Mechatronics Board, robot and software allow users to experiment with acceleration, magnetics, pressure and touch sensors, as well as electromechanical controls for industrial and consumer applications. 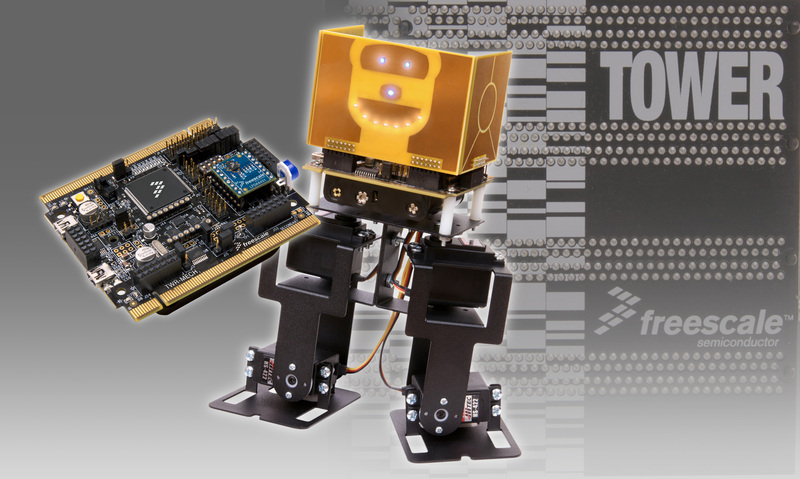 The goal of the Tower Mechatronics Board and sensor robot is to help designers create innovative projects as quickly and easily as possible. 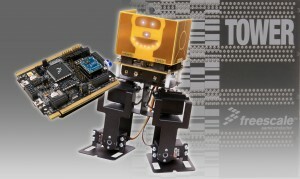 Freescale’s Robot kit operates with the Tower System Mechatronics Board is an easy-to-use mechatronics development and demonstration platform. This toolset allows for the science of combining mechanics, electronics, and software into an integrated system. The kit includes four PWM controlled servos (actuators), metal legs, and the Tower System Mechatronics board that has a 3-axis accelerometer and a 12 channel touch sensor. Through building the kit, you can experience what the 4 degree of freedom bipedal walking robot can do. The base robot runs in a tethered mode, with RobotSee and the Robot Vision Toolkit running on a Windows host. The upgraded robot has a 1GHz ARM Cortex-A8 with 1GB of RAM on-board. The upgraded robot is fully autonomous, and un-tethered. The ARM is running either Ubuntu, Embedded Linux, or Android. The upgraded/ARM version of the robot is $349.00, and ships with a full Ubuntu desktop with all development tools installed. Vision processing: OpenCV and custom CV algorithms available via the Robot Vision Toolkit. When upgraded with i.MX53 Quick Start Board all vision processing occurs on-board. Codecs, and Linux voice recognition applications.